AMC’s The Walking Dead is a massive hit, consistently bringing in strong ratings and becoming the sort of water-cooler series that’s increasingly rare in our fractured, over-crowded media landscape. It’s understandable that other networks would want a piece of that rotting, maggot-infested pie, and Syfy has declared their intentions to try and take The Walking Dead on head-on with Z Nation, an upcoming zombie series set to star Lost’s Harold Perrineau, among others. Now Amazon has released an extended trailer for Z Nation, and based on what we’ve seen, The Walking Dead doesn’t have anything to worry about. We’ve had a lot of good things to say about Syfy’s creative decisions in the last year, as the network has genuinely seemed to turn over a new leaf, launching an aggressive and ambitious development slate that includes adaptations of John Scalzi’s Old Man’s War, James S.A. Corey’s The Expanse, Arthur C. Clarke’s Childhood’s End, and more. There’s also a ton of original stuff in the works as well, including Z Nation, set three years after a zombie outbreak devastates the United States. The new trailer, which isn’t embeddable but which you can see here, introduces the general story arc for Z Nation, with Perrineau leaded a group on a cross-country mission to ferry the only known survivor of a zombie bite to a California lab where a cure may be extracted from his blood. But honestly, the biggest red flag comes before the trailer even gets to any footage from the show. It’s that title card that reads “The Asylum.” If that name isn’t automatically lowering your expectations, here’s why it should. The Asylum is the low-budget production company responsible for a good chunk of the cheesy B-movies you’ll find in Syfy’s lineup. They’ve recently had a breakout hit with the Sharknado movies, but for every so-good-it’s-bad movie in their catalog, they’ve got a dozen or so just-plain-awful entries. They’re also the folks who file the serial numbers off of popular mainstream movies and put out z-grade copycats like Transmorphers, Atlantic Rim, and 30,000 Leagues Under the Sea. Let’s just say this is not a brand that inspires confidence in us. That being said, Z Nation creator Karl Schaefer gives us some small sliver of hope that Z Nation might be good. He co-created the cult classic series Eerie, Indiana back in the 1990s, and he’s since worked on shows such as Dead Zone and Eureka, as well as the short-lived but fun mid ’90s Fox series Strange Luck. 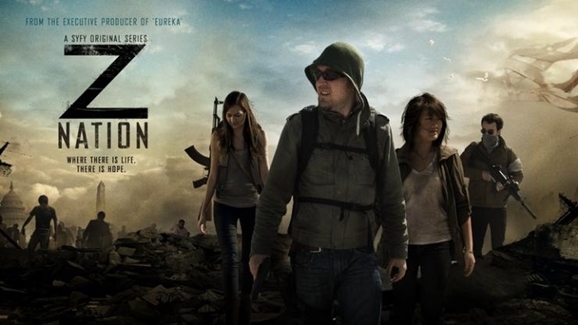 Z Nation will premiere Friday, September 12 on Syfy.